Runs with Sole: Run with Sole this Fall! All new programs announced! Run with Sole this Fall! All new programs announced! Wanna Girl's Night Out? How about one every week? We're redefining the Girl's Night Out with our all-new Women's 5K and 10K Programs! Don't worry, you can still have wine after the run. Ask yourself this: Have you always wanted to be a "runner?" Have you always tried to run but could never quite get it? Maybe you were a runner in a former life and you're ready to get back into it. Or are you an experienced runner ready to take it to the next level? We are offering a Women's-only Beginning 5K Program and an Intermediate 10K Program starting September 18th (the 5K Program) and September 19th (the 10K Program). 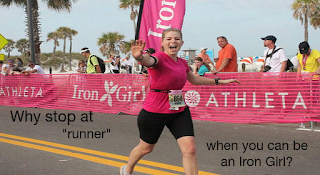 These women-only programs will be fun, supportive and just what you need to accomplish your goal of running a 5K or 10K race. We will be training for the Athleta Iron Girl 10K and 5K at the Del Mar Fairgrounds on November 11, 2012. Train with us and you'll have the chance to meet new people, become a better runner and have a blast! Runners will receive a detailed training plan, weekly coached runs, informational seminars, discounts of running gear and so much more! Please contact Coach Jenn at jenn@solehealthandwellness.com with any questions you may have! We are also running a super special on our nutrition programs. All members of our programs (either group program members or private clients) are eligible for nutrition counseling at a HUGE discount. All our Sole Mates are able to add on a nutritional evaluation with or without ongoing nutrition counseling for 50% off the prices listed. You will receive an in-depth evaluation and a nutrition plan developed specifically for your needs that includes customized menus, specific meals and shopping lists (in general, what to eat and when to eat it!) to compliment your training, daily activities and other goals. See our website for more details and contact us with any questions! Take advantage of this awesome deal! Your nutrition plan should be an integral part of your training efforts. You have to fuel your body appropriately in order to do all the things you'd like to do: from running errands to running a race. You would never put cheap, nasty gasoline in your car, would you? Why would you put cheap, nasty food in your body? Think of your body as a machine. You need to care for it with the right fuel in order for it to run well. Together we can develop a nutrition plan to help you feel good and reach your fitness goals! Whether your goals are to lose weight, get stronger, set a race Personal Best or simply change your current habits, we will work together to develop the plan that is best for you. Just as there is no "one-size-fits-all" training program, there isn't a "one-size-fits-all" nutrition plan. Remember, you will reach your goals when you run with Sole!